Need an easy and delicious treat for a class party, playdate, or just for yourself? These were so good! It's the basic Rolo Turtle from Christmas that a lot of people make, but being that it's Fall (& no nuts allowed in preschool), I used a candy pumpkin instead. Oh my yumminess! Cover a cookie sheet with pretzels. Top each pretzel with a Rolo. Put in a 250-degree oven until the Rolos are slightly soft (not melted!). 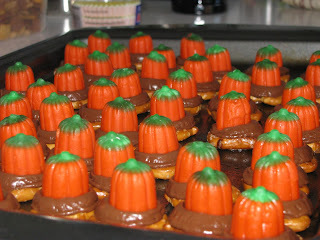 Take out of the oven, top each Rolo with a candy pumpkin. Let cool before serving (I put mine in the fridge to speed-up the process).